Thank you for taking the time to review Delphi Prism™. This guide is designed to inform you about the capabilities, features, and attributes of the product so that you can be fully informed when writing your review. Delphi Prism is a feature-rich, powerful development tool for the .NET Framework. By providing a powerful Object Pascal language that enables access to the entire .NET framework and a powerful, complete Integrated Development Environment (IDE), Delphi Prism is a complete .NET development tool. Delphi Prism is just not another .NET language that can be plugged-in to the Visual Studio approach, it is much more. Delphi Prism is a .NET implementation that is pushing the .NET Framework and language in new and exciting ways. Delphi Prism’s implementation makes developing .NET applications easier for the developers, takes advantage of the latest hardware designs, and delivers the latest from the Microsoft .NET Framework. Delphi Prism developers can design and deploy applications for ASP.NET, Windows Forms, and Windows Presentation Foundation (WPF). Plus, Delphi Prism is focused on the entire .NET world, not just the Microsoft side, and Delphi Prism can run against the Common Language Runtime (CLR) anywhere that it may be deployed, including the Mono platform on both Linux and the Mac. Delphi Prism will run on both 32-bit and 64-bit operating systems. The Delphi Prism installer is normally downloaded from the web. Media kits containing the entire product are also available. The installation executable will install the entire product. If a current install of Visual Studio 2008 is already present on the machine, then Delphi Prism will integrate into that existing installation. 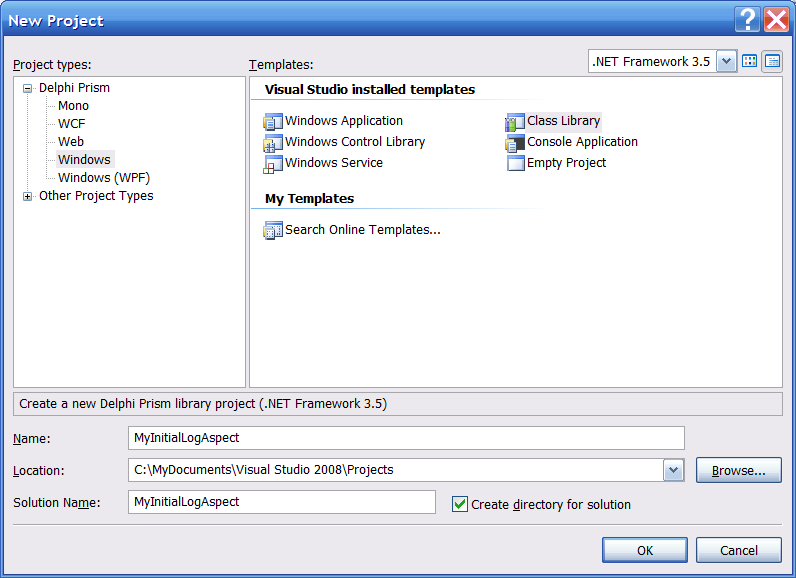 If there is no Visual Studio 2008 present, then Delphi Prism will install the Visual Studio Shell before installing Delphi Prism into the Shell. Delphi Prism is available in two different editions – Professional and Enterprise – to cater to different market segments. The Professional edition of Delphi Prism is designed for developers who need a general purpose, .NET development tool with limited or local-only database access. The Professional edition includes the full-featured IDE, the Delphi Prism language, local access to InterBase and Blackfish SQL via dbExpress for ADO.NET. In addition, the Professional edition includes a database-neutral implementation of the ASP.NET Provider Model with support for Blackfish SQL and InterBase. The Professional edition is attractive to Independent Software Vendors (ISVs), professional developers without a need for remote database access, and any developer wanting to develop general Windows applications and utilities. The Enterprise edition of Delphi Prism is designed for developers who want remote access to dbExpress databases, specifically Blackfish SQL and InterBase. In addition, the Enterprise edition enables the development of clients to connect to multi-tier servers built with DataSnap in Delphi 2010. Delphi Prism is also available as part of Embarcadero RAD Studio 2010 Professional, Enterprise and Architect editions. Delphi Prism is shipped with language support for English, French, German, and Japanese. Developers can choose any of the four localized versions to install. One of the main features of Delphi Prism is its support for the CLR where ever it resides, particularly Mono for Linux and Mono for the Mac. Delphi Prism’s compiler is a managed code application and can run on Mono for both Mac OS X and Linux. In addition, the compiler produces completely standard Intermediate Language (IL)-based assemblies, meaning that those assemblies can run on the Common Language Runtime (CLR) on any operating system. 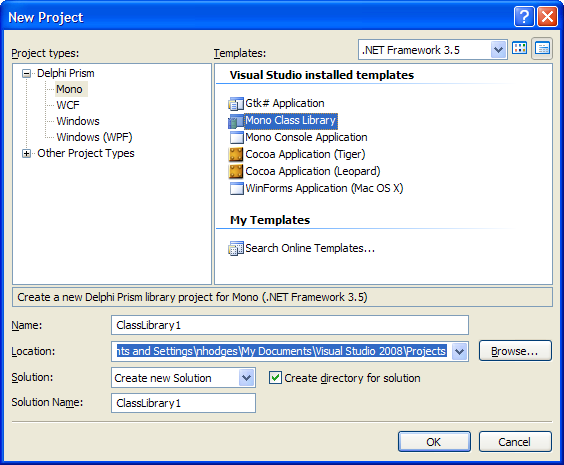 Delphi Prism provides project templates for starting Mono projects on Windows, Mac OS X, and Linux. Figure 1 -- The New Project dialog showing templates for developing Mono applications. More information about running Delphi Prism applications on the Mono platform can be found in the Embarcadero Developer Network Article entitled “Using Mono and Delphi Prism”. Delphi Prism ships with the Mono for Windows 2.0.1 platform, installing it if the user desires. Delphi Prism includes the powerful dbExpress framework, adapted to work with ADO.NET. This means that .NET developers are not limited to a specific backend database, but instead, can use a single framework to communicate with multiple databases. This version dbExpress includes support for InterBase and Blackfish SQL, with more databases to come in future feature updates. Delphi Prism also includes a dbExpress-based implementation of the ASP.NET Provider model. Therefore, Delphi Prism developers can not only access data in a neutral way with dbExpress, but they can also use a dbExpress-based database for their roles, profiles, and membership requirements in ASP.NET. Delphi Prism also includes an ADO.NET driver for DataSnap. DataSnap is Embarcadero’s powerful, dbExpress-based multi-tier development framework. With Delphi 2010, developers can build middle-tier application servers that provide “gatekeeper” access to any backend database. These servers can provide both direct connections, access to data, and general method functionality via server methods. Server Methods are special methods provided by a class on the application server. By using the dbExpress typing system, developers can easily expose server methods to DataSnap Clients. Delphi Prism provides the ability to import a DataSnap server into ADO.NET. Server Methods that return Datasets are viewed as tables, and server methods are viewed as Stored Procedures. Thus, developers can, in effect, write stored procedures in Delphi code and consume them in Delphi Prism. The Delphi Prism roadmap calls for the ability to build DataSnap servers in Delphi Prism. The Delphi Prism language is a powerful, full-featured language for use with the .NET 3.5 Framework. It supports all language idioms required by .NET, including features like LINQ, anonymous methods and delegates, generics, etc. But, in addition to supporting the required language idioms, Delphi Prism is leading the way with first-to-market language features like Class Contracts and Aspect Oriented Programming (AOP). These approaches make Prism not only easy for Object Pascal developers to use, but also Delphi Prism gives them the tools develop better software. Delphi Prism has strong roots in the world of Object Pascal, and thus the syntax will be very familiar to any Delphi developer. If required, existing Delphi code can be easily migrated from Delphi for Win32. Generics allow the developer to write code that refers to a type without having to specify the specific type of that type. Often called Parameterized Types, generics provide developers with the ability to write general, or “generic’ classes that operate on a non-specific type. The class use case for generics is a list, where the type of the items contained within the list need not be specified when the list is written. The members of a generic class that reference the generic type will have their actual type filled in at runtime by the Just-In-Time compiler. The Microsoft .NET Framework comes with several built-in generic classes, e.g. the List<T> type, which is a dynamic list structure containing references to any number of type T. T can be any type at all, and Tlist<T> will be a type-safe list of whatever type the developer desires. Generics can also constrain the type passed as a parameterized type. Using constraints can ensure that the generic type passed as certain functionality, implements a specific interface, is a class or record, or has a parameter-less constructor. Class invariants are restrictions placed on a class declaration that will ensure that a given variable meets a given state. For example, the following class declaration requires that the SomeInteger variable always be greater than ten. If code assigns a value less than ten to the SomeInteger variable, and Assertion will be raised. Class definitions can add require sections before the method body, and an ensure section at the end of a method body. These sections define pre- and post-conditions that must be met for the code to execute normally. These sections are Boolean statements that will be checked to be true before and after execution. Class Contracts are normally used to check for the validity of input parameters, results, or for the state of the object required by the method. If a Class Contract is “broken”, an assertion is raised. The 'old' scope prefix can be used in the 'ensure' section for local variables and parameters to refer to the original values before the execution. The compiler will add code to save these to local variables before executing the method body; 'old' is supported for strings and value types. Both Method Contracts and Class Invariants allow developers to explicitly and clearly declare the requirements for code, ensuring that code is of higher quality and performs as expected and designed. 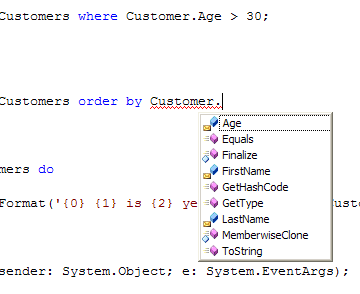 Note the assignments to the YoungCustomers variable that use the new LINQ syntax for selecting customers easily out of the customer Sequence. LINQ can also be used to query against Datasets and any other data structure that supports an enumerator. Property Notifications are a language feature that provides notifications to properties when the value of the property is changed. When notify is used on properties, the class will implicitly implement the System.ComponentModel.INotifyPropertyChanged and System.ComponentModel.INotifyPropertyChanging interface and invoke the event defined in that interface when the property itself is modified. By default, it will pass the name of the property as defined in the class, however, notify supports a string parameter to change the name of the property passed to the event. If the Microsoft PFX Framework is installed as part of the .NET environment, a parallel loop will spread execution over multiple cores and threads. Futures are a new language concept designed to facilitate Parallel Computing and developing applications that scale well on multi-core and multi-CPU systems. A future is a strongly typed variable that represents a value that might or might not have been calculated yet, but is guaranteed to be made available when needed. Instead of calculating the value of "l" in place as before, "l" is now defined as a future Int32, declaring that the variable does not actually hold the value of Left.Sum, but just the promise that, at some point in the future, it will. This first line of code will execute in virtually no time, and the method can move on to calculating "r", which is unchanged and will happen in line, as before. Methods marked with the Async keyword are executed in a separate thread. Implementation depends on whether the PFX framework is present. If so, Async statements are run via the PFX framework as a task; otherwise, they are added to the .NET thread pool. If an async method returns a value, that value becomes a future. The concepts behind AOP have been around for a rather longtime, not originally known as Aspects, but approaches that implemented the Visitor Design Pattern, or Meta-Object Protocol found in Lisp. Each of these approaches allows the developer to create “clean” objects because they can add behavior at runtime. So in essence, the designer can create a specific object, with methods, operations, and attributes to be solely focused on that object, thus making it “clean.” Then at runtime, the clean object can have additional behaviors and attributes added for additional functionality. A relatively easy example for most developers to understand is the classic Customer object discussion. A customer is responsible for it attributes and methods, a clean customer object does not worry about things like security or logging as those two behaviors don’t really apply. By using Aspects to add behavior and attributes at runtime, the developers can keep the Customer object “clean” and add those needed behaviors later. This makes the design much easier to understand and also adds consistency to the added behavior. This design approach can be used to expand modularity and reduce the “un-clean” objects that happen. You may hear this referred to in AOP speak as Concerns and Cross-Cutting Concerns. If you take the above Customer example above, a Cross-Cutting Concern may be either Security and or Logging. The reason why Security and Logging would be considered Cross-Cutting Concern is because those behaviors are needed across many objects not just the Customer class. 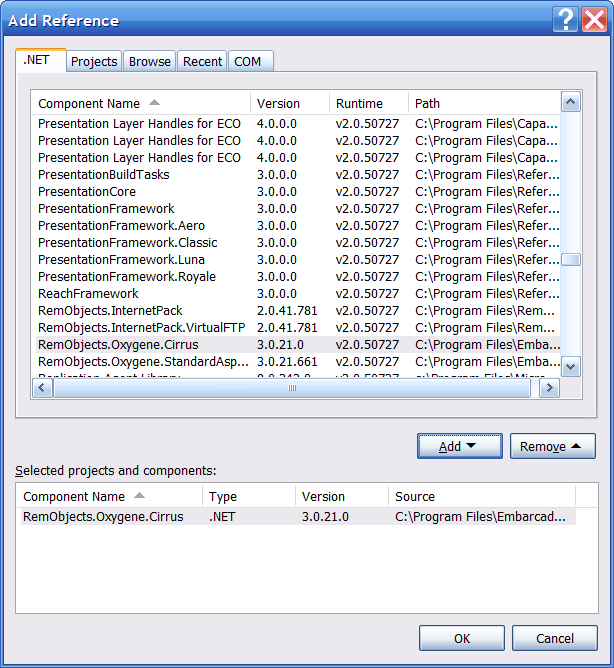 The Aspect Oriented Programming (AOP) feature found in Delphi Prism is another example of where the underlying language and compiler are leading the development field in .NET. In Delphi Prism’s implementation of AOP, the developer can change the behavior of code, as in the example of the Customer explained above. However, it is a full AOP implementation that allows for the ability to add / remove fields, properties, events, methods, and extra classes. Aspects are a special kind of attribute that can be attached to an existing class or the classes’ members. The great part is that you don’t have to learn a new language, because these special kinds of attributes (Aspects) are written in the Object Pascal found in Delphi Prism. Delphi Prism uses a new library (Cirrus) that implements the approach. The first question that is usually asked is how do you make an Aspect? This is an almost exact example that is found in the PrismWiki. Hopefully the additional step-by-step guide of creation make the example even more concise. 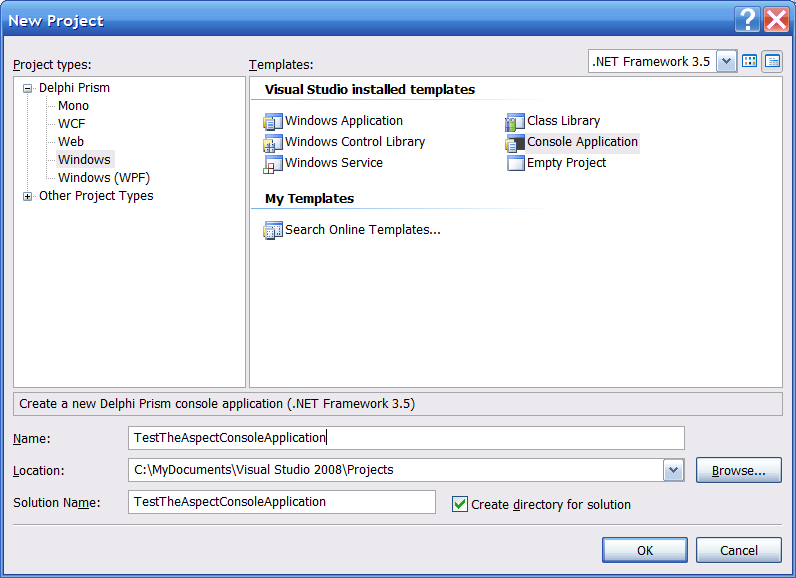 Select the Windows item under the Project types: area and the ClassLibrary from the Templates area. Enter MyInitialLogAspect in the name area; also notice that the Solution Name has also changed. Then press the OK button to continue. Now we need to add the Cirrus assembly to enable AOP in Delphi Prism. 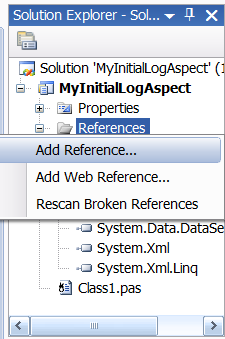 In the Solutions Explorer right-mouse click on the References folder and select the Add Reference… button. When the Add Reference dialog appears, scroll down to the RemObjects.Oxygene.Cirrus assembly and press the Add button. This will add the assembly to the list, note: that you can select more than 1 assembly in this interface if needed. Once complete, click the OK button to add the assembly to the project. Notice in the solutions Explorer that the assembly was added. Next add the Uses clause to the class library. Now to create a new Attribute Class called LogMethodAttribute. So what is special about the above declaration? The AttributeUsage() – tells where it can be used. IMethodImplementationDecorator is a special Interface that is defined in the Delphi Prism AOP Library – Cirrus. The HandleImplementation method takes two things, the IServices interface and the IMethodDefinition interface. IServices interface is responsible for finding and defining types, and producing messages from the types operations. IMethodDefinition allows the interface for modifying the method header and body. We already know that we have to implement the HandleImplementation because we are using the IMethodImplementation interface. We also want to add a logging method. The [Aspect:AutoInjectIntoTarget] attribute is going to tell the compiler how to generate the proper code for injection to the target class. Now that we have defined the methods for the class in the public area, we should do a Ctrl-Shift-C for the class completion; this will generate the Implementation methods. Now, all we want to do for the LogMessage method is write-out the method name that we are either entering or exiting, which is defined by the aEnter boolean variable. For this example, we do not care about the Args. Now, we want to focus on the HandleImplementation method and this is where the real work is done. This first thing we want to check when getting the Method name to log is if the method name is ‘LogMessage’ because that is our injected method and we don’t need that reported. The second thing we want to check for is if the method is a constructor. We use the ‘.ctor’ for that, because we don’t need to report the constructor method either. So if either of those checks is true we would exit the method and move on. Next we want to figure out if we are entering the method or exiting the method. First we set the aEnter variable to true for entering and then we check to see if that is true, if not we then set it to exiting the method. Note: if the standard settings were used, the newly created library should be in the Debug directory. This library will have to be moved to the client library before running the client. Now we need to build the client to test our newly created library that implements a logging aspect. Select the Windows item under the Project types: area and the Console Application from the Templates area. Enter TestTheAspectConsoleApplication in the name area; also notice that the Solution Name has also changed. Build and Run the Console application. This will establish the \Debug directory structure. 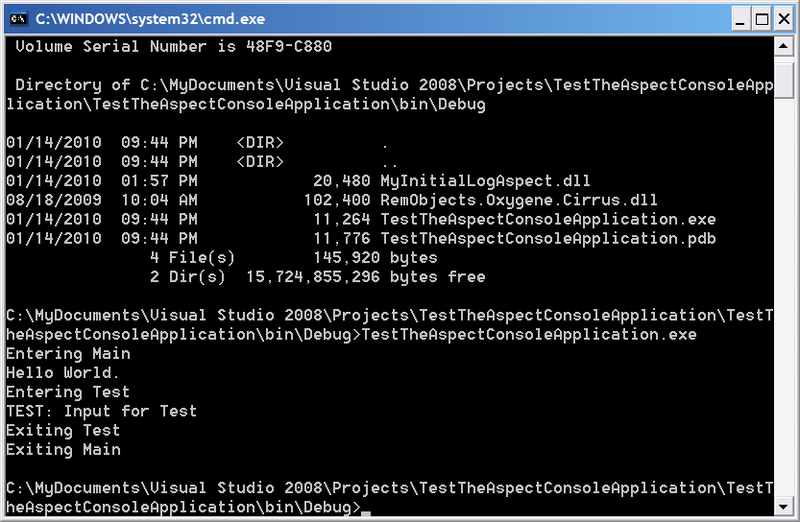 Next copy the MyInitialLogAspect to the \Debug directory of the console application. 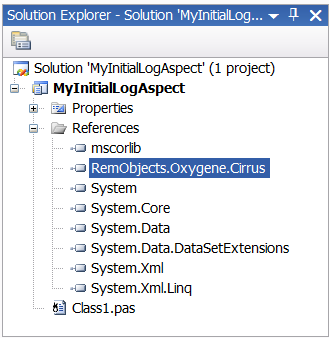 Then we need to reference the MyInitialLogAspect and the Cirrus library in the project. Most likely you will have to use the Browse tab to find the library in the project \Debug directory that we copied it to. Then we also want to add the RemObjects.Oxygene.Cirrus assembly also, as shown above. When finished click the OK button to continue. Now modify the Uses clause with the aspect. Next we have to set the Aspect Attribute in the code. This is done inside the type definitions section. NOTE: Make sure that the Aspect that is defined is the same one in the class library that you created. It should be the Class Attribute name without the Attribute on the end. I.E. The definition for the Aspect in the class library was: LogMethodAttribute = public class(…) so the Aspect would be LogMethod, as below shows. Then we can add a Test method and fill out the Main method. The implementation should be rather simple and for the sake of space I will show the lines added. Notice the injection was completed and the output shows the logging of when the application was run. Delphi Prism includes all the expected language structures (objects, arrays, records, sets, enumerated types, case statements, for loops, etc.) and many additional language features such as Extension Methods, Anonymous methods and delegates, attributes, class references, interfaces, Lambda expressions, and operator overloading. A complete examination of the Delphi Prism language can be found on the online wiki. Delphi Prism integrates with Visual Studio Shell as an IDE. As a result, Delphi Prism developers have all the power and features of that platform. If Delphi Prism is integrated into a Visual Studio installation, then Delphi Prism project groups can include code from C#, VB.NET or other languages, and projects from those languages can include Delphi Prism code as well. Delphi Prism developers can utilize all the power of the Visual Studio IDE including IntelliSense, Error Info, Code Snippets, Parameter Info, debugging and more. Delphi Prism is a fully integrated language plug-in and a full-fledged member of the .NET language eco-system. Delphi Prism developers can utilize all the design-time support for Winforms, ASP.NET, and WPF development. When integrated with Visual Studio itself, Silverlight design-time support can be installed. Delphi Prism developers can install and use the vast array of third-party components for WinForms, ASP.NET, WPF, and Silverlight. Components from vendors like Developer Express, Infragistics, TMS Software, and other commercial vendors are all useable in Delphi Prism. Open source and freeware components written in other .NET development languages can be used. 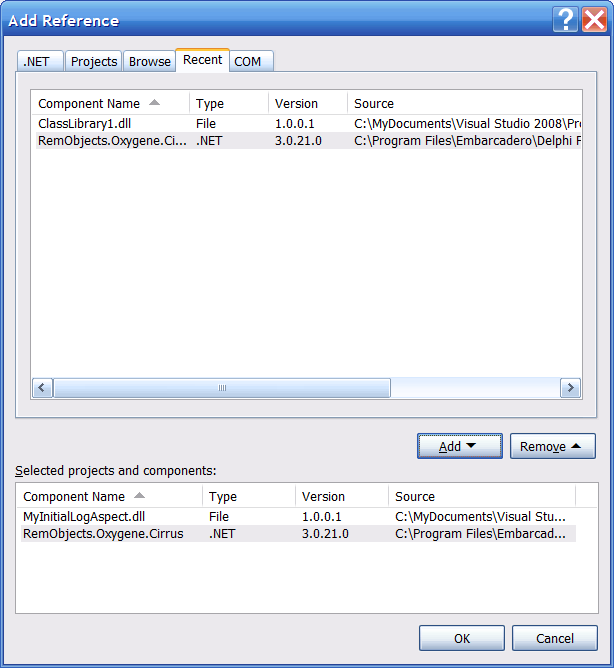 The full array of .NET components is available to Delphi Prism developers. Figure 3 -- Delphi Prism includes full IntelliSense support for Delphi Prism developers. In addition, Delphi Prism integrates the dbExpress database framework in Server Explorer, allowing developers to access dbExpress drivers via ADO.NET. Delphi Prism ships with dbExpress drivers for InterBase and Blackfish SQL, with additional drivers to be added in future updates. Documentation for Delphi Prism is wiki-based. In addition, a snapshot of the wiki is shipped with Delphi Prism, so developers can have a copy of the wiki on their own systems. In addition, developers can at any time grab their own snapshot of the current state of the wiki for themselves. Because the documentation is wiki-based, the documentation can be frequently updated and continually enhanced, both by Embarcadero employees and community members. Articles can be added and enhanced, and examples can be included. Overall, this makes for a dynamic documentation experience, with the help being continuously improved and frequently updated. Delphi Prism ships with a number of third-party tools and products. Delphi Prism ships with a Developer Edition of InterBase, Embarcadero’s native, cross platform Relational Database Management System (RDBMS). InterBase Developer Edition allows developers five connections to the server hosted on their local machine for the purpose of developing applications that use InterBase. Once the application is developed, developers can purchase deployment licensing from Embarcadero. More complete information about InterBase can be found on the Embarcadero website. Blackfish SQL is a high-performance, small-footprint, SQL-92 compliant transactional database. Blackfish SQL is a fully-managed RDBMS that runs on both .NET and Java. Running either in-process or out-of-process, and with a small footprint of just over one megabyte, Blackfish SQL is easily deployed and embedded, yet retains the full power needed by all types of database applications, from enterprise applications to embedded ISV applications. 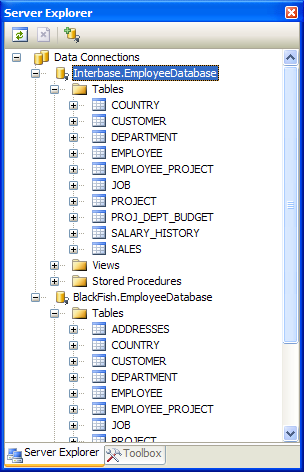 Delphi Prism includes a special edition of Blackfish SQL – Blackfish SQL RAD Studio Edition. The RAD Studio edition is freely deployable with any application. Professional edition users can deploy applications built with Blackfish™ SQL with the limitation of local only connection to 1 user/5 connections and databases up to 512 megabytes in size. Enterprise and Architect developers can deploy applications with as many as 4 users/20 connections and 2 gigabyte databases. If developers require deployment beyond those limitations, additional unrestricted deployment licenses can be purchased from Embarcadero. More information about Blackfish SQL can be found on the Embarcadero website. Delphi Prism by default will install the Mono for Windows 2.0.1 framework. Developers can create new projects to run against this framework. More information about the Mono framework can be found at the Mono Project. Delphi Prism includes a number of recommended tools for download. They are summarized on the wiki’s Recommended Downloads page. DPack Collection of tools for Visual Studio is a free download that includes a number of experts, Wizards, and plugins for Visual Studio that enhances the Delphi Prism experience and that makes it easier for Delphi developers used to the Galileo IDE (i.e., the IDE from Delphi 2010) to adapt to using Visual Studio. Features include numbered bookmarks, automatic solution backup, a Code Browser, and a keyboard binding that matches the standard keyboard layout for Delphi’s Galileo IDE. More information can be found on the DPack homepage. The RemObjects Internet Pack is a lightweight and easy to use TCP/IP framework built on top of the .NET Socket library. More information can be found on the website for the Internet Pack. Developer Express provides a collection of 60 free and fully functional components for .NET developers. 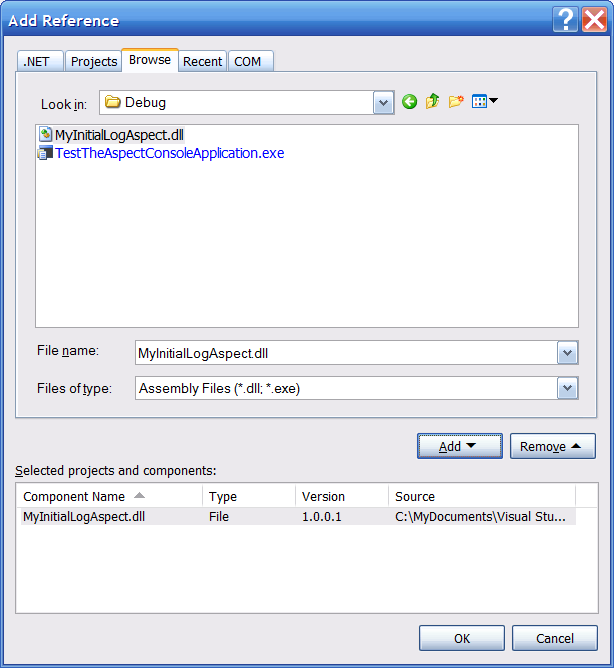 They include components for WinForms, ASP.NET, and WPF development. ShineOn is a Delphi Prism implementation of the Delphi for Win32 RTL. Delphi developers can use it to aid in the process of moving existing Delphi code into Delphi Prism. More information about the ShineOn project can be found on the Delphi Prism Wiki. Oxidizer is a free tool that, when used in combination with ShineOn, helps to port Delphi (Win32 and .NET) projects to the Delphi Prism language. Oxidizer is a command line tool that will process *.pas source files from Delphi and make many necessary changes to adapt the code to the Delphi Prism language. More information about the Oxidizer Code Converter can be found on the Delphi Prism Wiki. As noted above, the complete documentation for Delphi Prism can be found at: http://prismwiki.codegear.com. The wiki includes a “Crash Course” on learning Delphi Prism. The Embarcadero Developer Network also includes a Delphi Prism area that provides links, articles, videos and more about Delphi Prism. Embarcadero Technologies, Inc. empowers application developers and database professionals with award-winning tools to design, build and run software applications in the environment they choose. With the acquisition of CodeGear from Borland® Software Inc. in 2008, Embarcadero now serves more than three million professionals worldwide with tools that are both interoperable and integrated. From individual software vendors (ISVs) and developers to DBAs, database professionals and large enterprise teams, Embarcadero’s tools are used in the most demanding vertical industries in 29 countries and by 90 of the Fortune 100. The company’s flagship tools include: Embarcadero® Change Manager™, Embarcadero® RAD Studio, DBArtisan®, Delphi®, ER/Studio®, JBuilder® and Rapid SQL®. Founded in 1993, Embarcadero is headquartered in San Francisco, with offices located around the world. For more information, visit www.embarcadero.com.